Autohydro the state of the art hydrostatics/stability program, performs intact and damaged analyses and produces customized stability reports which are accepted by all major governing approval bodies. 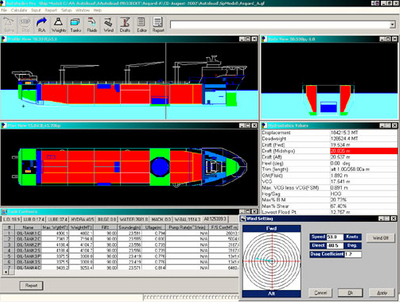 Autohydro is a complete hydrostatics and stability calculations program for naval architects, ship designers and marine engineers. A true 'floating simulator', Autohydro reports the reaction of the model to various conditions, such as a loading configuration, a damage situation, conditions involving outside forces, wind or high speed turning momentum or some combination of these. Autohydro can also be used to obtain hull form characteristics and capacities. Vessel attitude is displayed graphically and in text on the screen. Report information, text and graphs, can be shown on the screen, edited, printed, saved or exported to other Windows applications. Entire vessel models may be generated in Autohydro or the user can import hull shapes from Autoship and then add geometry such as tanks, compartments and superstructure. Vessel models are defined by transverse sections, which can be entered by using a digitizer or by typing in offsets, or defined by creating a combination of primitive shapes such as cones, boxes or surfaces of rotation. These objects can be fit or joined to the hull or to each other. Tank contents, effectiveness and specific gravity relating to each component as well as sounding tubes and margin lines can also be defined. The user has 3 methods for performing calculations. The pull down menu system can be used for most loading condition set-ups and simple calculations. Individual commands can be typed in for more complex calculations. Or the run file editor can be used to organize many commands for lengthy calculations and to generate in-depth reports. The run file editor has a built-in error checker to verify all commands. Users can develop a library of run files for future use and modification. Autohydro operates under Windows and provides a graphic, intuitive interface. The main screen shows Profile, Plan and Body View plus a full report of current vessel attitude including Draft, VCG and GM with FSM. Autohydro will calculate using tanks, cargo spaces and compartments in intact, damaged, frozen or spilling conditions. Waves and wind velocity and direction may be specified. As well, Autohydro calculates for high speed turning and grounding situations. Full reports and graphs of loading, longitudinal strength, stability, righting arms and hull parameters can be produced, edited and saved or sent to the printer. As well, Autohydro can evaluate stability with regard to published stability criteria and a warning is issued if the limit is not met. Output from Autohydro has been accepted by all major governing bodies such as Lloyds, Det Norske Veritas, ABS and the U.S. and Canadian Coast Guard. Edit reports off-line either using Autoship Report Editor or MS Excel. Format Reports and use Excel marcos to automate report formatting. Calculate additional values from results produced by program. Generate reports in either A4 or 8 1/2" X 11" format. Autohydro: Standard version: Intact stability, handles up to 25 tanks. Autohydro Pro: Advanced version: Intact and damage stability for unlimited number of tanks, longitudinal strength calculations and IMO Subdivision Index for cargo vessels. Hardware required: For optimum performance we recommend a fast Pentium with 16 MB of RAM, 10 MB free disk space, 1 MB graphics card and an SVGA monitor.